Situated in a remote region of northwestern Colorado and extending into eastern Utah, you’ll find Dinosaur National Monument. 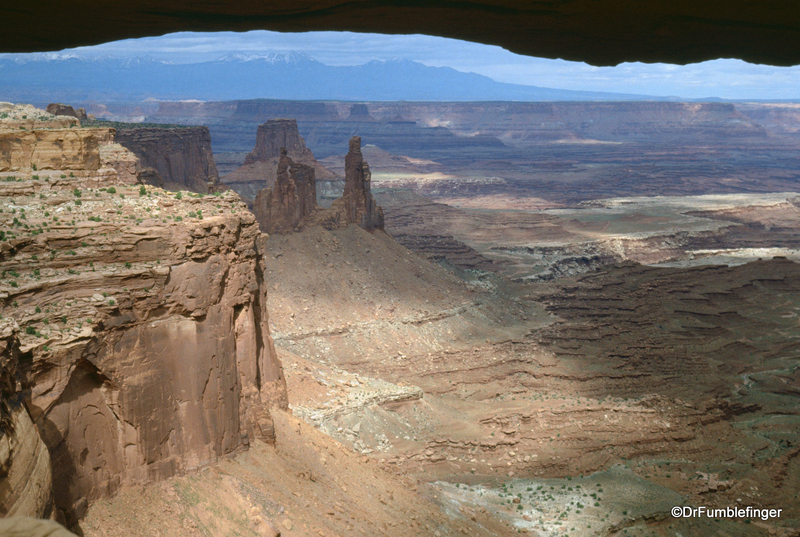 This is Green River country, the river winding through memorable rock formations and desert landscapes. But the real treasure of the region is what’s beneath the ground. You’ll find some of the world’s largest deposits of dinosaur bones in Dinosaur National Monument. Our visit today is to the monument’s Fossil Bone Quarry. The dramatic eroded landscapes of Monument Valley have been immortalized — largely because of John Wayne. You read that correctly, actor John Wayne. It was in this valley that director John Ford filmed the young movie star in a series of Westerns, the drama and action framed against Monument Valley, scenes that for many people around the world defined what the American West was like. Monument Valley is fairly high altitude, around a mile above sea level (1500-1800 m). It’s landscapes are characterized by colorful sandstone buttes, banded and eroded. Monument Valley is close to the Four Corners region and is a park within the Navajo Nation. One of the Most Scenic Road Trips in America! The Grand Army of the Republic Highway (Hwy I-70). The United States has some of the planet’s finest scenery and boasts dozens of great drives. From the California’s Pacific Coast Highway, to Montana’s Going to the Sun Road, to Newfound Gap Road in the Smoky Mountains, there’s scenic drives in almost all parts of the country. But I think this highway is one of the best. As it winds through eastern Utah and western Colorado, you see varied scenery including desert with memorable and colorful rock monoliths, the Colorado River, canyons and the lush forested Colorado Rocky Mountains. Perhaps the world’s best picture is framed by the bottom of this arch. A storm was blowing through the Utah desert and enhanced our view with a nice pattern of light. The view says it all, doesn’t it? Nothing more I can add to that. The United States is blessed with some beautiful geography — perhaps more varied than that of any other land. Utah especially has some extremely unusual geology and is home to 5 National Parks, surpassed only by Alaska and California. There is perhaps no more beautiful area in Utah than that around small city of Moab, adjacent to which Arches National Park is located.